Support for the fast by anti-corruption campaigner Anna Hazare is unlike anything seen in India for decades. Around the world, the non-violent protests against graft led by Anna Hazare are being watched with enormous interest. From London to New Jersey to Malaysia, expat Indians are holding candlelit vigils in support of the movement. It’s being touted as ‘India’s second freedom struggle.’ In the 65 years since India’s independence, my parents say they haven’t seen anything like this. Is Hazare a frontman for vested interests, or is his heart really in the right place? I offer my two cents. 1) While the best way to prevent bribes is to stop people offering them, this is easier said than done in India. Unless one knows a politician, government official or bureaucrat who can pick up the phone to ‘fast track’ a given process, many feel compelled to pay a bribe to clear the numerous bureaucratic hurdles they face in this country. It’s often a choice between nepotism and corruption, something tens of millions of Indians have been forced to confront. 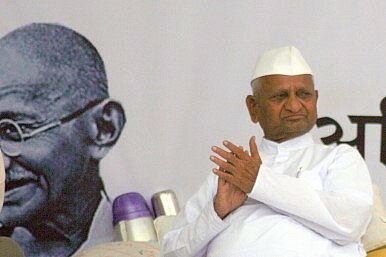 3) As a member of civil society in the world’s largest democracy, I and other Indians haven’t elected Team Anna (consisting of Anna Hazare and his handpicked civil activists) to express opinions and concerns. 4) If Kalmadi (the ex-Commonwealth Games chief and a Congress politician currently in jail on charges of corruption) can be labelled corrupt, so can Yeddyurappa (a politician from the opposition Bharatiya Janata Partywho was forced to resign recently). Yet I haven’t seen any statement against the latter from Anna Hazare or his team. Why the different standards for a Congress politician and a BJP politician? Yet despite these reservations, I am standing firmly in Hazare’s corner simply because he’s fighting for something that I (and most Indians) care deeply about – a strong Jan Lokpal (Ombudsman). When the United Progressive Alliance forced Hazare to break his first fast, in April, I believed that the government was serious about its commitment to a potent Lokpal bill. Since then, we have had little progress and another fast by yoga guru Baba Ramdev. But Ramdev’s effort appeared comical, even farcical, and so many have dismissed Hazare’s latest fast as a tired publicity stunt. The version of the Lokpal Bill currently supported by the government is a reflection of Prime Minister Manmohan Singh’s image in the country – weak and toothless. It doesn’t cover the prime minister (or senior judges) and wouldn’t have had any impact on the recent scams unearthed around the country. Singh did finally make public his stand on corruption in a speech on Independence Day. However, he failed to inspire an ounce of confidence in most people. His message was clear – corruption won’t disappear overnight. But it was left unclear what his party will do to make a start on tackling the problem. Unfortunately for the government, the Indian public has run out of patience. Anna Hazare is no saint. But the voters are left with the disappointing choice of the UPA or the National Democratic Alliance – a coalition of political parties led by the BJP. Both have their fair share corrupt politicians. To the BJP’s credit, some of its leaders are supporting inclusion of the prime minister in the purview of the Lokpal. But this by no means suggests they are deserving of power. Eradicating corruption in public life will require the establishment of a series of steps toward transparency that will take more than just the passage of a strong Lokpal bill. Yet without this initial step, the journey can’t begin. And, right now, Team Anna seem to be the only ones that understand this. Tanuj Khosla is a research analyst at 3 Degrees Asset Management, a fund management firm in Singapore. He can be followed on Twitter @Tanuj_Khosla. Alternatively he can be reached at [email protected] The views expressed are his own. UPA to Blink Over Lokpal?BJP Speaks at Hazare FastCongress vs Anna Hazare?Anna Hazare Meet DisappointsAnna Hazare Going Too Far?